Centavite is a comprehensive well-balanced formulation which contains key vitamins and minerals to provide daily nutritional support. Each tablet contains essential vitamins and minerals including Vitamins A, B, C, D & E, folic acid, antioxidants, selenium, calcium, iron & zinc. 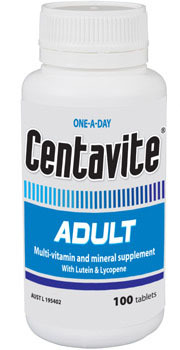 Each Centavite Adult tablet contains Betacarotene 1.8mg, Vit A 300mcg R.E., Vit D3 15mcg, Vit E 50mg, Vit B1 2.18mg, Vit B2 3.2mg, Nicotinamide 15mg, Calcium Pantothenate 10.8mg, Vit B6 6mg,Folic Acid 300mcg, Vit B12 20mcg, Vit C 90mg, Biotin 45mcg, Vit K1 25mcg, Iron 5mg, Calcium 200mg, Magnesium 50mg, Zinc 7.5mg, Iodine 150mcg, Potassium 80mg,Copper 1mg, Chromium 35mcg, Manganese 5mg, Selenium 55mcg. Lutein 500mcg & Lycopene 600mcg. Each Centavite Adult tablet is embossed with "CV" & scored. Each Centavite 50+ tablet contains Betacarotene 1.8mg, Vit A 300mcg R.E., Vit D3 15mcg, Vit E 75mg, Vit B1 2.18mg, Vit B2 3.2mg, Nicotinamide 15mg, Calcium Pantothenate 10.8mg, Vit B6 9.7mg, Folic Acid 300mcg, Vit B12 25mcg, Vit C 90mg, Biotin 45mcg, Vit K1 25mcg, Iron 4mg, Calcium 200mg, Magnesium 50mg, Zinc 7.5mg, Iodine 150mcg, Potassium 80mg, Copper 1mg, Chromium 100mcg, Manganese 5mg, Selenium 55mcg. Lutein 500mcg & Lycopene 600mcg. Each Centavite 50+ tablet is embossed with "CV 50" & scored. Centavite Adult & 50+ are available in 30's & 100's. Dosage Adults: Take one tablet daily with water. Both contain no lactose, gluten, yeast, added salt, artificial flavours and preservatives. Both are Halal approved.